My Mum’s 80th Birthday had my three siblings & I, all together for the first time since my Dad’s funeral in 2010. Mum is enjoying the sunny life of an ex-pat (immigrant) in Costa Blanca, Spain ….so I had the double whammy pressure of holidays and celebrations to contend with on my sugar & alcohol free week away. 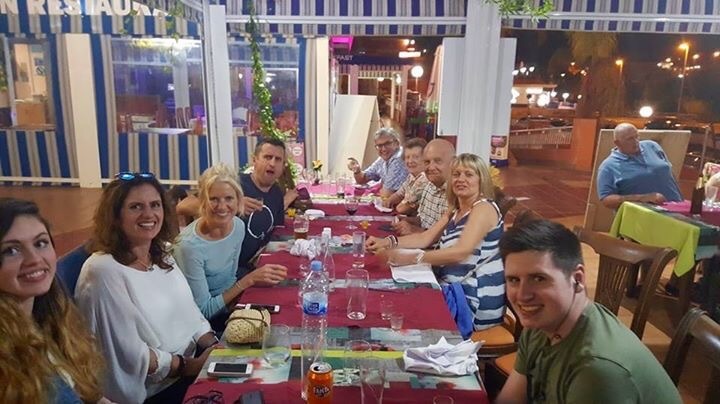 The lifestyle of Brits living abroad is very social….a half bottle of wine is often included in the price of a “menu del dia” – as is a sugar laden pudding and an alcoholic shot to finish the meal. Many of the people I met, insisted that “they don’t drink much”….but acknowledged that it was almost impossible to resist the wine that came as part of the meal….or the complimentary Baileys that landed at your seat without having to ask. This habit of drinking without conscious thought is something I hope to break with my year off alcohol. Meeting up with a group of much loved people that I normally drink with was a challenge. Years of meeting up in pubs, with many happy memories reveals a pattern of behaviour which made abstinence difficult. Granted I felt sooooo much better than everyone else in the morning, but I did feel a weeeeee pang of envy as the laughter flowed along with the beer…(my laughter included I hasten to add)….but that buzz just not quite there. One of my brothers lives in Qatar….where he has been for 18 months and where abstinence is largely dictated by local law….with only one shop in the whole country selling alcohol to residents – the only alternative to the international 4 & 5 star hotel bars. His routine abstinence didn’t seem to have influenced him….Interestingly, as he was one of the few in the large group who had hired a car, the only sign I got that he was making up for lost drinking time, was a reluctance to be one of the required drivers to a lunch venue that was more than a walk away from where we were all staying. This underlining that his normal abstinence is not through choice…..and when he moves back to Europe, he is unlikely to adopt abstinence as an option. My other brother, overweight and admitting to an unhealthy lifestyle during the week – is considering how he can make better choices surrounding alcohol, stress & exercise…. recognising that he is not ready for total abstinence, he is considering 12 months without beer as a step in the right direction….and he knows I’ll nag…. At nearly 10 months in, I’m still not sure what the end of my year of abstinence will bring. I know I want my default position to be “make mine a sparkling water” …with an alcoholic choice being far far less likely – but I also know how hard society, and indeed my own history, makes this. I am hopeful that recognising the benefits of this year will help my determination – I’m an all or nothing kind of girl….I find just having a couple FAR harder than saying no completely! Published by Creating a healthy future - free from sugar. 50 plus year old mother of three, self confessed reformed sugar addict who is re-writing her future by creating healthy habits and upsetting all the family by reducing the sugar available. View all posts by Creating a healthy future - free from sugar. Next: Next post: Why do we think it’s going to be hard?